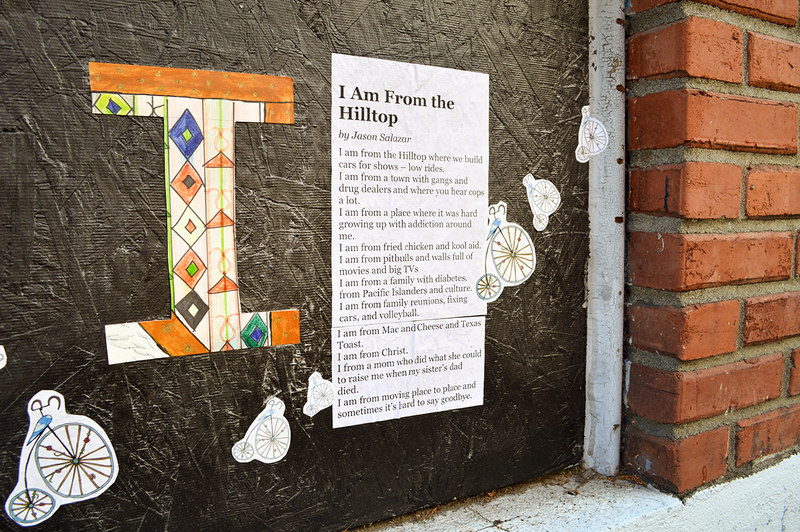 A poem by Jason Salazar, written while attending the Write@253 writing center, pasted to an alleyway wall at 11th & Court C as part of a group mural project with Spaceworks Tacoma in 2013-14. For all those drawn to writing and poetry, and for those with a heart for Hilltop… make sure to see the City of Destiny Poetry Slam: Hilltop Edition proudly organized by Write@253, the Tacoma Historic Preservation Department, and local poets Nicci Montgomery, and Michael Haeflinger. For more information and to register for the slam, people may contact Lauren at LHoogkamer@cityoftacoma.org or destinycityslams@gmail.com. This is a chance for everyone to get together, meet, write, and share work. It’s chill and drop-in, so come by and say hello. We will have info on the workshops and an open mic! Catalina Ocampo will lead this workshop on the theme of maps. Led by slam poet Georgena Frazier. Cathy Nguyen will lead this workshop on what it means to own your story, stylize your wordplay, harness your voice, and pen your legacy.